Need to know how to pack a guitar? 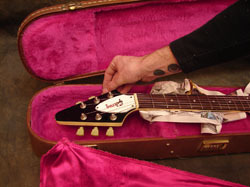 Here's some sound advice and tips on how to pack an electric guitar. We will ask you to refer to these instructions if you sell us a guitar. 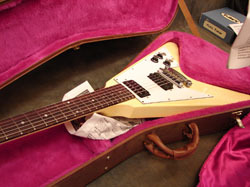 Never send us a guitar you are interested in selling unless you have contacted us prior to shipping. Important: It's easy to forget the simple things. There's nothing worse than a perfectly packed guitar getting damaged from loose accessories or parts in a case. 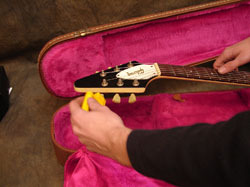 First remove the guitar from the case and check for loose objects like bridges and accessories that will bounce around and scratch the finish. When selling your guitar also check for any personal possessions. Put any loose items in the accessory compartment or separate padded envelope within the larger shipping box. 1. Guitar strings create hundreds of pounds of tension on a guitar's neck. If strings are not loosened prior to shipping, a dropped or mishandled box can result in a broken or snapped neck. Loosen the guitar strings so that the strings are barely tight, just enough to avoid drooping. 2. Also make sure all the tuner knobs are parallel to the guitar case so they are not in-contact with case. 3. 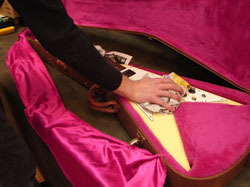 Place the guitar in the case and observe where there is space between the guitar and the case. 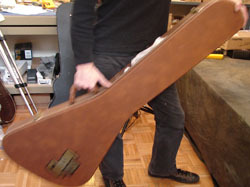 The goal is to insure that there is no movement of the guitar within the case. 4. 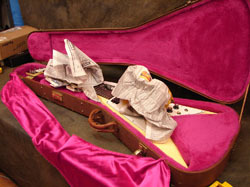 Now remove the guitar and insert crumpled newspaper under the body where it is not tight in the case. Close the case and make sure the case can still be easily closed. 5. Repeat this process if needed under the neck. Close the case and observe how the case closes. If it's hard to close the case remove some newspaper and try again. 6. It's also a good idea to put a little pressure (using newspaper) paper over the bridge. 8. Now add newspaper on the top and sides of the guitar as needed. DO NOT PUT ANY NEWSPAPER UNDER THE ACTUAL HEADSTOCK. This might seem counter intuitive but if the headstock is packed tight and unable to flex and the guitar moves just a little bit the entire guitar acts as a lever against your headstock and can cause your headstock to crack. 9. If you can pick up the guitar case and shake it a bit and don't feel any guitar movement then it's properly packed. You should not have to use a lot of force to close the case, closing the case should take gentle pressure and just be a bit snug. 10. 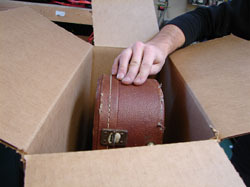 Now find a sturdy box, preferably a box made for shipping guitars. 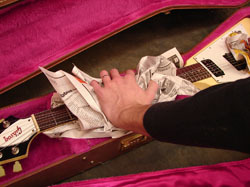 Insert a small amount of packing material or newspaper in the bottom of the box before you insert the guitar case. It might be easier to place the packing material on the box then insert the case. 11. Suspend the guitar in the middle of the box. 12. 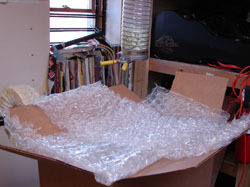 Now fill the box with packing material insuring that the packing material is between the box and the guitar case. 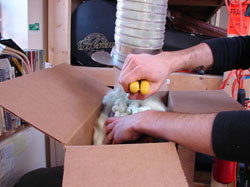 If using packing peanuts You may have to shake the box gently to eliminate any air gaps. Add packing material on top of the case to insure packing there will be protection between the top of the case and the end of the box. 13. 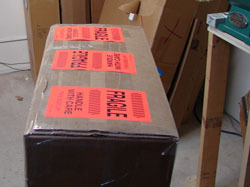 Seal the box and be sure to mark the box Fragile" on the box. You are ready to ship your guitar. Be sure to fully insure the guitar. While proper packing will minimize the chance of damaging a guitar it is impossible to eliminate all possibility. Always insure your guitar for it's full value. 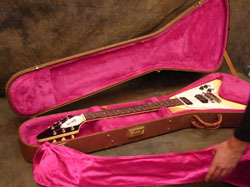 It might also be a good idea to take a few photos of the guitar before shipping to verify it's original condition. We are always buying guitars and amps. If you're considering selling your guitar or amp please consider selling it to us. We pay top dollar and are great to work with!